Midnight City is a publisher with an eye for quirky experiences, and may be familiar to Wii U owners through its publishing of Double Fine's Costume Quest 2 on the system. 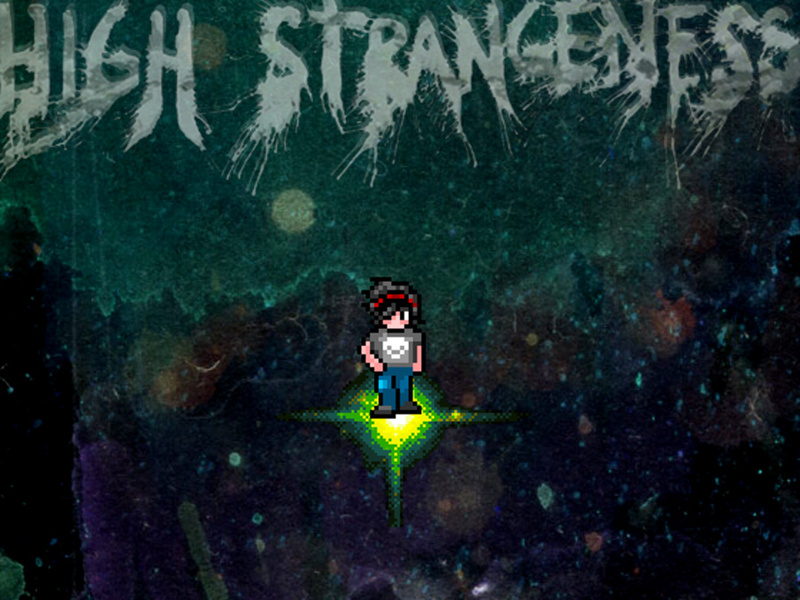 It's now stepped up with High Strangeness, developed by Barnyard Intelligence Games. It's described as "a hybrid of 8 and 16 bit games - a 12 bit adventure", incorporating retro RPG and adventure game mechanics. Jumping between bit-based realities, with watercolour illustrations also thrown in, you need to solve puzzles and tackle the strange storyline. It's out now in North America and costs $9.99 - we're working on a review right now and will let you know what we think of it soon. How many of you in North America are tempted to pick this up? Will read the review. I'd like to know why switching between the 8 and 16-bit aesthetics is important. Is it purely to find things in one world to then use in the other? or does it also affect how you fight enemies? I'm interested to see what you guys have to say about it in your review. The last game I played that was described as "12-bit", Mutant Mudds, was blissful. Hoping this is good. It definitely looks like something I'll have to check out. It's a little too strange in my opinion. The story is terrible, but the gameplay is decent. It got 7 on Destructoid. It looks interesting,hopefully it comes to Europe soon. I may pick it up, that's assuming that I will actually finish it while I'm playing Xenoblade. Gonna wait to read a review or two, but it's awfully intriguing. I strangely like what I saw... I will need a review of course, but I like the concept this has of jumping between bits. Oddly, it seems to have a Secret of Evermore-ish, maybe even Earthbound-ish vibe to it, so I'm definitely intrigued. That looked really good! I'll wait to see some reviews on it. @Tops IGN (YouTube) had a developer interview. It was for everything you said. The game looked & seemed to run smooth. It would of been a better interview, but I felt the developer didn't really sell it. I'm getting the game. @TomKnows @Pahvi Ok, cool, thanks for the info! If I had more time and less of a backlog, I would pick this up. Kinda reminds me of....Secret of Evermore. @oats-81 For me, it was StarTropics that kept popping in my head. This game reminds me of the switching between 2D and 3D in Paper Mario. Definitely feeling a StarTropics vibe here, as others have noted. So many people waiting around for reviews. -_- Come on guys, does anyone make their own judgements with games anymore? Or is other peoples opinions the all or nothing to trying a game out for ourselves? What if it does get a bad review? Maybe you'd have liked it but now you won't even give it a chance personally. Just silly. You're seriously chastising people for making informed purchasing decisions on an indy game they've never heard about and a developer they're not familiar with? I'm really not trying to come off as chastising, but I've seen perfectly fun, decent games get passed over because of the overall review score average. Not even super bad scores mind, as I do think some games can be broken and beyond playable live 3s, 4s, and 5s seem to mean, but most times nowadays reviews seem more bias towards popular games. And I say this because in a review for an overhyped game they will say 'it lagged often' but it'll get a 8/9. Different game, more obscure developer and they score a 6/7 and that same issue is it's only flaw. I just don't think an overall buying decision should be based off of reviews. If you want to make sure the game isn't broken ok, but people treat reviews like something holy that should be followed and I think when that happens the community misses out on some great games, even if they aren't perfect A+ titles. Heck, I'm not saying buy the game blind or anything like that. But as long as it's not broken I do think trying different forms of games is a good thing, not because of some review from a singular person who has their own play style and likes, but because it's a game and that's what they are there for. Gaming should be about fun. Not all, but most developers put their hearts into it. Again, I wasn't trying to be mean. I love reading reviews, especially from here, and seeing if a game is up my alley. My frustrations come when a game scores lower than a certain number, people choose not to even try it which I think can potentially be a loss, and why so many developers choose to be so repetitive when developing games. They stick with what the people want, and the people say new and upcoming games that don't score an 8 or above go on the very back of their list. @legendwaker You make it sound like reviews exist only to convey the writer's opinion of the game, but that's really only half of it. Reviews are also good for providing in-depth gameplay details and generally explaining how the game works. That extra information can be key in deciding whether or not a game is right for you, so I don't see anything wrong with holding out for it. I share your frustration with people that focus solely on TEH SCOREZ without properly reading reviews, though. Sometimes I wish everyone would just do what Kotaku does and drop the numerical scores entirely. @ekreig omg yes, mutant mudds is brilliant. this looks interesting and i'll probably pick it up if it scores an 8+, $10 is kinda steep but if the gimmick leads to good enough gameplay it'll be worth it.